It is often referred to as the rice granary of Kerala. 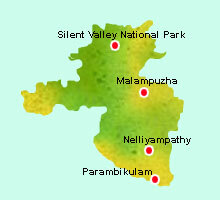 The district of Palakkad is the traditional gateway to Kerala from the north. One of the larger districts of Kerala, Palakkad has a topography that is a blend of forest cover, rivers, valleys, hills etc. It is also one of the regions in Kerala having a tribal population and the district has close cultural ties with the adjoining state of Tamilnadu, towards its east.